Key Difference: Tennis is a popular sport that was first played between 1859 and 1865. The tennis courts can be located either outdoors or indoors; depending on which, the courts can either be made out of grass, clay, or a hard court made out of concrete, asphalt, or acrylic. Tennis is a popular sport that was first played between 1859 and 1865. It developed in the nineteenth century, and was a variant of a popular sport called racquets. It was developed by Harry Gem and his friend Augurio Perera, who combined elements of racquets and the Basque ball game pelota. Believe it or not racquets was developed as a pastime in debtors’ prisons, where the prisons would hit a ball using racquets against the prison walls as a source of entertainment. Racquets itself was developed from the game of fives, which was a form of handball. Like racquets, tennis was also played with a ball and a racquet. However, unlike racquets, tennis was not played against a wall, but rather on a court facing the opponent, with a net in the middle. Additionally, two players can play against each other in a singles game, or in teams of two called doubles. The objective of the game is for the players to hit the ball over a net into the opponent's court. The aim of the game is to play the ball in such a way that the opponent is not able to play a good return. Hence claiming a point for the person who makes the other one not able to play a good return. While the basic equipment of tennis includes a tennis ball and a tennis racquet, the most important part of the game is the court. 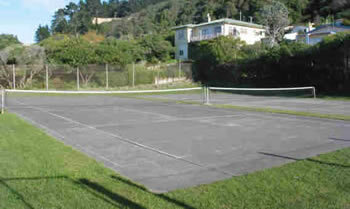 There are many different types of tennis courts, and depending on the court, the player may have to adjust their technique. A tennis court is 78 feet (23.77 m) long, and 27 feet (8.23 m) wide for singles matches and 36 ft (10.97 m) wide for doubles matches. It has a low net stretched across the center. There is additional clear space around the court to allow players to reach overrun balls. The tennis courts can be located either outdoors or indoors; depending on which, the courts can either be made out of grass, clay, or a hard court made out of concrete, asphalt, or acrylic. 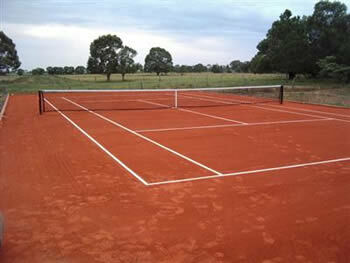 Clay courts are made of crushed shale, stone, or brick. They are more common in Europe and Latin America than in North America. Clay courts are cheaper to construct than other types of courts, but are more expensive to maintain, as they require to be rolled to maintain flatness. Also, the clay's water content must be balanced. Clay courts slow down the ball and produce a higher bounce as comparison to other courts. Clay courts are harder for serve-based players, as they take away a lot of the advantage of big serves. 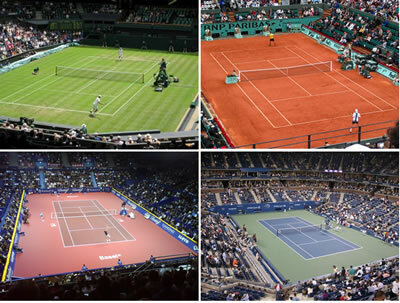 The French Open is the only Grand Slam tournament to use clay courts. 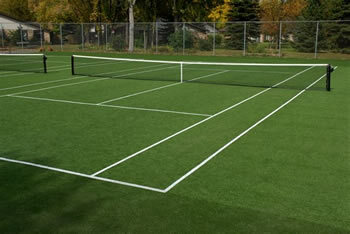 Grass courts are the fastest type of courts in common use. They are very versatile and are commonly used for personal courts. Grass courts are made up of grass grown on very hard-packed soil. Their bounce depends on a variety of factors, including on how healthy the grass is, how recently it has been mown, and the wear and tear of recent play. The low bounces keep rallies short, and the serve plays a more important role than on other surfaces. They are better for serve-and-volley tennis players. Grass courts are becoming increasingly rare as they are harder to maintain. They must be watered regularly, as well as mowed. Wimbledon, the oldest grand Slam tournament, still plays on a grass court. 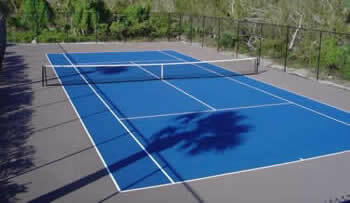 Hard courts are made of uniform rigid material. They can be made up of a variety of materials including concrete, asphalt, acrylic, artificial clay, artificial grass and other materials such as tiles, wood, or canvas. Depending on the material used, the speed of the court will vary. However, hard courts are usually never as fast as grass courts. Hard courts are generally more equalizing than clay or grass in terms of playing style, although they favor harder-hitting baseliners and all-court styles with the current equipment. Both the US Open and the Australian Open is played on hard courts. Indoor courts are most commonly hard courts. However, some indoor courts may be made up of carpet; however this is not that common. Indoor courts are generally made up of a mixture of rubber granules and synthetic resin, which provides a cushioned feel and facilitates medium fast bouncing surfaces. While the pervious types of courts are all official and sanctioned by the Tennis Association. There are a variety of unofficial courts as well, where many regular people, who are not professional players, come to play. A makeshift tennis court can be made up on a variety of other surfaces made from hardwood, granite slabs, acrylic, plastic tiles, artificial grass carpets, etc.